Purchase online in India HC-12 Wireless Data Transmission Module at low cost from DNA Technology, Nashik. HC-12 Module is easy to use simple serial 433Mhz wireless Module based on proven Silab's SI4463 RF Chip and STM8 MCU on single module making it easy to use with serial UART data. The serial RF module is a low cost, high performance transparent FSK transceiver with operating at 433 MHz. It features small size, high output power, high sensitivity, long transmission distance and high communication data rate with auto set up for communication change and data receiving and transmission control. With the UART interface, it is easy to setup the wireless data transmission with only providing the UART data. It is flexible for the users to set the UART baud rate, frequency, output power, data rate, frequency deviation, receiving bandwidth etc parameters. It is your ideal choice for designing wireless data transmission products which can be widely used on wireless data transmission field. There is MCU inside the module, and user don’t need to program the module separately, and all transparent transmission mode is only responsible for receiving and sending serial port data, so it is convenient to use. The module adopts multiple serial port transparent transmission modes, and user could select them by AT command according to use requirements. The average working current of three modes FU1, FU2 and FU3 in idle state is 80μa, 3.6mA an 16mA respectively, and the maximum working current is 100mA (in transmitting state). 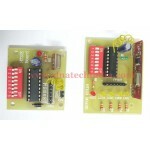 This module can not work individually, at least 2 pcs would be needed to create the communication. Please also note that this module do not work with the 434Mhz Serial RF Module HC-1.